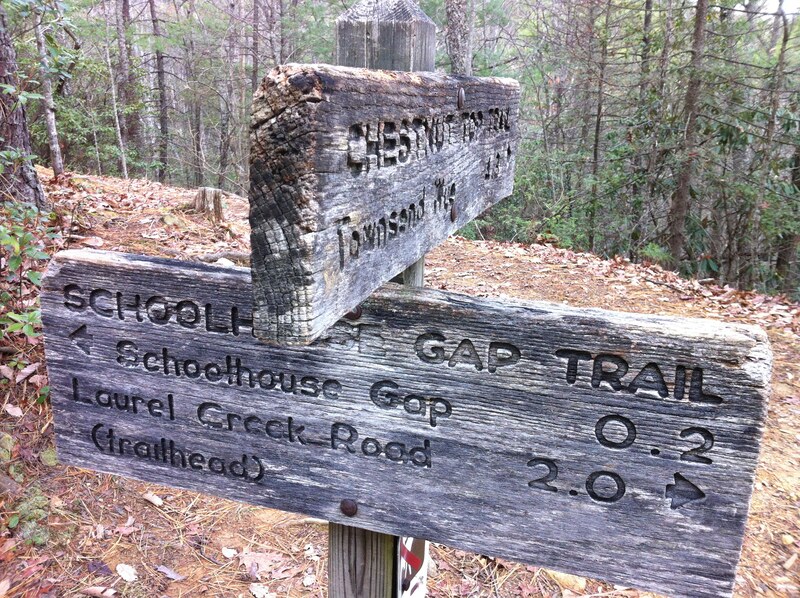 The sign at the top of the Schoolhouse Gap trail, where we hiked this weekend. Whenever Bruce and I return home from a trip out of town, he says, “I miss everywhere but Orlando.” I usually bristle when he says this, wishing somehow that we should be loyal to the city where we live. I try to emphasize in my mind the comfort of our home, the pleasant view of pines and palms and palmettos out the wall of sliding glass doors across the back, the presence of my sweet kitties, the large live oaks that line the streets of our neighborhood and trail Spanish moss like so many dream clouds. There is a lot to like about where we live and how we live. Yet it’s true that I haven’t found a sense of home here, and I am reminded of that every time I go back to East Tennessee, as I did over Thanksgiving weekend to visit my dad and his wife. I have that creeping middle-aged feeling that it was a good place to live, though I couldn’t wait to get away from it when I was young. There was, after all, a whole world to explore. Surely in all that world, I thought, there must be some perfect place. Now, when I go back to Sequoyah Hills, where my family lived for three years during the late 1960s, and where my father has lived the past fourteen years, I think it might be the most perfect place. I feel at home in my body there, and in the nearby Great Smoky Mountains, even though my connections to both places and to East Tennessee in general might seem tenuous. One thing I always notice when I’m back in East Tennessee is just how nice everyone is. On this trip, Bruce and I stopped off at a convenience store for drinks, trail mix, and a pack of sandwich cookies to take on a short hike in the mountains. In spite of the fact that the stretch of Alcoa Highway we were driving along is not doing too well—numerous storefronts papered over and a few buildings bulldozed—the clerk was cheerful. She rang us up promptly and politely asked if we wanted a bag. As I put my wallet back in my purse, she actually said, “Y’all come back soon!” I laughed and told her we were just visiting so it wasn’t likely, and then I felt stupid, as though this might be rude. So I added, “But next time!” and she grinned at me and waved as we pushed through the door. This always happens when I am in East Tennessee. Always. It’s not that I never encounter a grumpy person there, but such are greatly overshadowed by nice people, friendly people, people willing to chat, people who treat you like you are another human being. I don’t realize I miss it until it’s there in front of me again. I wonder about it, too. For a long time, I wondered if it meant that people were dumbly accepting of their “place” in life. I mean, shouldn’t clerks in convenience stores, working the Saturday after Thanksgiving, be somewhat resentful of those of us cavorting in the woods on vacation? Doesn’t their cheerfulness let me off the hook too easily in my middle-class life? I mean, no revolution is going to come from that attitude! There was always a kind of acceptance exhibited by people in East Tennessee that my restless soul never felt, even when I lived there. My family was more about ambition and less about community, though years later my mother gave me a T-shirt that says, “If you’re lucky enough to be in the mountains, you’re lucky enough.” Even though I readily acknowledge the down side of too much acceptance of the status quo, I also think I would have done well myself to learn better the importance of commitment to community and of a sense of self-worth that is rooted in something other than achievement. There is, in fact, something in kindly behavior that asserts (better than resentment) that we are all fellow travelers and that we all deserve each others’ respect. There is a lack of shame in a habit of friendliness, a democratic sense that we each play an important role in life unfolding. I find again and again that in East Tennessee, there’s less adherence to a corporate script and more ad libbing. Even more than this native kindness, though, I feel a connection to East Tennessee simply through my senses. I feel it through the easy adjustment of my body as the car curves along the hilly roadways. My lungs seem to expand and my nostrils open wider in the pine-scented air with the right amount of moisture. The light creates halos around people and objects in its brightness that is seldom harsh. Even the sound of dogs barking in the evening is resonant and pleasant, deep and cushioned by the hills and trees, and so unlike the shrill, neurotic sound of dogs in Orlando. But, of course, there’s also a lack of complication that I’m suspicious of in my view. Going “home” is like being a tourist in my own past—there were indeed fewer complications when I was a kid. Even the difficulties I recall are blunted with distance. No doubt I had sharp emotions then as I do now, but in retrospect, they fade and the familiarity of the place feels only good. I wonder if nostalgia can ever be a genuine emotion. Posted in Psychology and tagged Great Smoky Mountains, Knoxville, nostalgia, Orlando. Bookmark the permalink. Interesting. I, too, have no sense of place in my region of residence. Waking up this morning, I realized it was 13 years to the week that I first moved to Seattle, and have spent 11 of the last 13 years here. Oddly enough, I am used enough to the city itself (we live about 5 miles south of downtown), but when I’m outside Seattle that the “I am not of this place” feeling really hits. I used to grumble aloud about it, which would provoke a “bristle” out of JB, and now I just internalize it. I guess I wanted to share my bad mood and that would do it, believe me. But I quickly (ok, maybe not so quickly) realized that was not making me feel any better in the long or short run. The less I think about it the better. But because my work in ecology/environmental policy has always been centered in the place I live, there is not much escaping it. I should have gone to pharmacy school. Instead, I get to look over Excel spreadsheets of chum salmon harvest in Puget Sound 1974-2009. Woo-hoo! And an aside about regional dialects. Some folks at work cringe when I say “crick.” But I can turn that on and off, so I turn it on only in the office. ;>). Then I explain that it’s from the Scotch-Irish immigrants, and how those immigrants influenced speech across a wide swath of the middle of the country. Then I launch into why everyone should read “Albion’s Seed” and by then people are running away…. You raise another whole interesting point about how work so often gets to be about things other than what it was originally about. What you say about place reminds me that it doesn’t even matter how great a place it may be that we’re in. Today after I posted, I had errands to do and was out in a perfectly delicious Florida fall afternoon. You live in Seattle, one of the most enviable locations on earth. Yet we aren’t quite home in our heres. I suppose it has to do with some formative moments that stick with us, though some people find their homes only after they are adults. I met such a woman in Moab a few years ago, who had visited as a tourist and decided it was the place for her. Hmmm…. And accents and dialects are another whole universe. You and I could probably write a book about that. Or at least a long string of anecdotes. Another gorgeous piece of writing, Lisa. And a place I also love so! Thanks, Gigi. We should all meet up there some time.